I’d learned through previous mistakes that I need to be much more careful when unpacking the cameras. so I called up one of my good friends, Clovis Blackwell. he’s a professor at a nearby university – so I asked if they might have a dark room we could use to unload at his school. he wasn’t sure that would work, but he suggested we used an inner room at his house. I was a little hesitant, but he assured me that we could make it light-tight. after a delightful dinner with his wife, Liisa and son, Xavier – we cleared off the table, poured some whiskey, and tried to figure out which cameras still functioned. we had a pretty massive collection of battery types, so we’d pull a camera out of the box, determine the battery type, then see if it still worked. I was actually quiet surprised by how many of the cameras still functioned. or at least, functioned enough that the rewind mechanism still worked. we often determined this by taking pictures. in fact, the first time we did this we thought we had to shoot out the entire rolls before they would rewind. later we learned this wasn’t the case… but it did result in a few photos of each other taken from across the table. 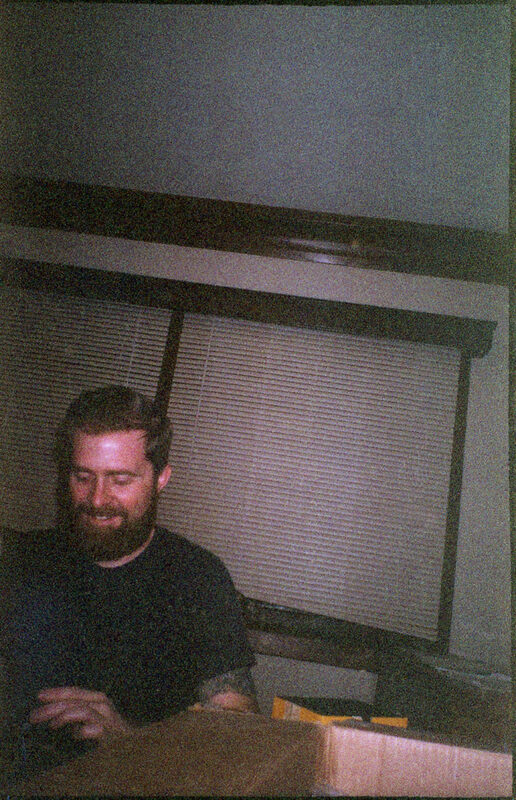 we got the film out of every working camera, then took the rest into the “dark” room. 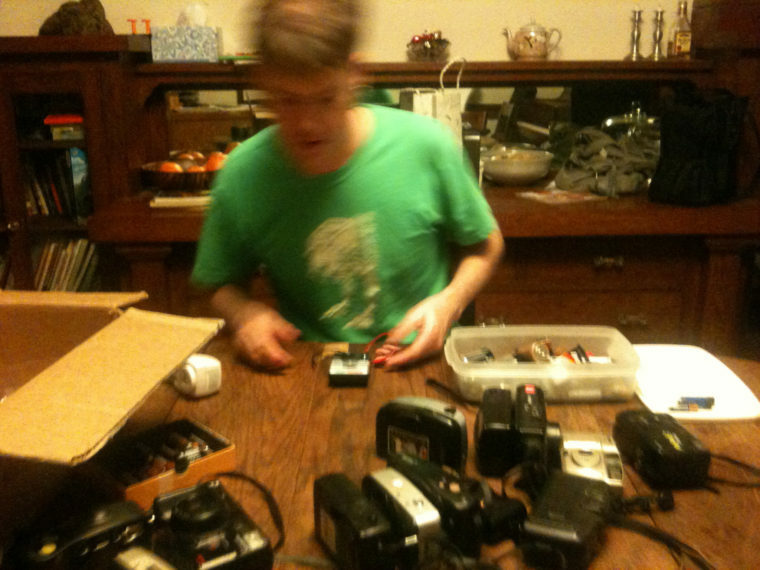 after turning off the lights we each opened up a camera and manually rewound the cameras. it was slow going pushing the film back into the canisters, but it seemed to work just fine. and it was definitely better than losing the entire roll to a light leak. here is the haul of film from that first night unloading. the next day I walked down to Schulman Photo lab and dropped the rolls off. well, most of them. there were a few odd ball film types they couldn’t handle. a quick search on the internet turned up The Photo Lab in Costa Mesa. They had a mail order service, so those photos were soon in the mail. 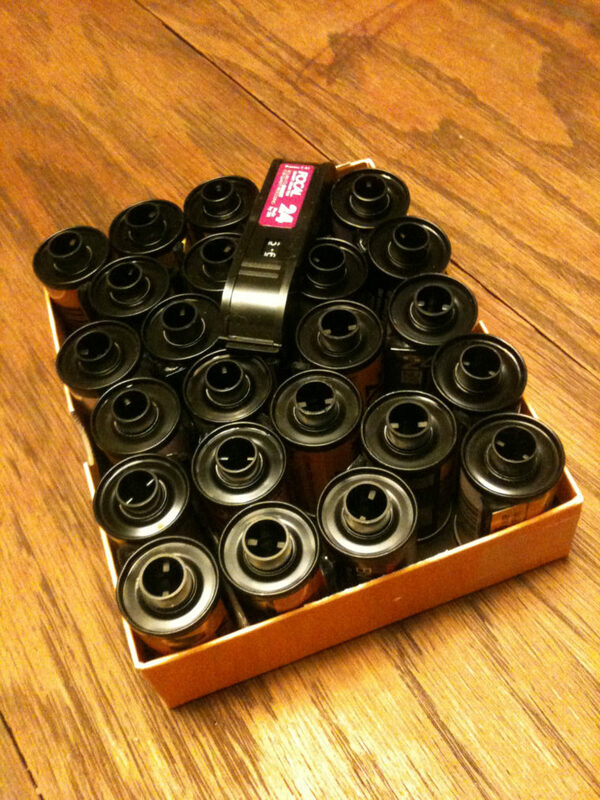 after a few days I was went to pick up the film. I was terrified of their being nothing on the film… or there being something horrible and disturbing on there. I thought there was a chance… albeit a slim one, that when I went to pick up the photos the police would be waiting for me. I imagined myself in handcuffs being pulled away screaming “No, it’s for an art project in an unspecified mediuuuuuuuum.” haha I’m only half joking… I really didn’t know what to expect. there were no police waiting for me. I paid my bill and took the CD and my negatives home. without wasting a moment I popped the CD with the image scans in…what treasures awaited me? had the film been ruined? were the photos beautiful? the film wasn’t ruined. there were images on almost every roll. some had less than five. others had more than twenty. overall, there were a LOT of photos. and the thing about the photos that struck me the most was… how “normal” they were. that first batch had a great deal of photos that shared some similar subjects – and those were kids, pets, and parties.